1. Live a life filled with compassion and positive action. Buddha wasn’t the only religious leader who wanted you to be compassion – you can find that teaching in others like Jesus Christ and Mohammed. It isn’t just beneficial to the world, it’s beneficial to your own spirit too. Compassion is critical to finding peace within yourself and taking care of yourself. And it may sound a little bit corny, but we all do better when we all do better. It annoys me to hear people to prattle on about “waking up” because it’s usually said in such a condescending way, but there is some validity to the idea of seeing the world for what it truly is. It requires mindfulness, that is paying attention to the little things around you. Many people don’t ever learn how to do that. So wake up, live mindfully, pay attention – whatever you want to call it. Just do it. You may think it’s an overused and maybe even cliche quote but there’s a reason you hear it all the time: it’s among the most powerful of human thoughts. If you want to see a more peaceful world, be peaceful. If you want to see a healthier environment, plant trees. Whatever you want to see in life, do it. Death has become so taboo in the west. It’s gotten to the point where we tell people who are dying of cruel, painful diseases that they are legally not allowed to end their lives comfortably. Being so freaked out about death doesn’t enrich our lives. Moreover, in the West we’re taught to plan for a future that isn’t even promised to us instead of paying close attention to the moment we’re in right now. If we ignore the end of our lives, we can’t ever be happy. 5. What you eat is important. What does food have to do with Buddhism? 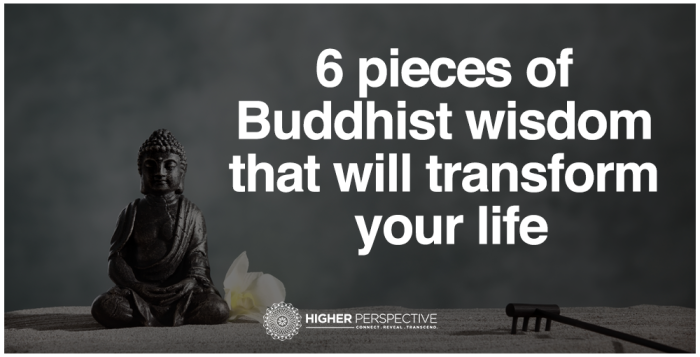 Buddhists understand that food plays such an important role in your life, and that when you have a relationship with it, we can transform our lives. Think hard about what you eat, where it’s been, and how it got to your plate. 6. Relieve yourself of the “three poisons. These three things are responsible for most of our unhappiness. If you experience any of them, take a deep breath and think hard about them. Consider your desire for money or your hate for an ex that treated you poorly. Does it get you anywhere? How can you work yourself out of it?